Women who have an X chromosome with an affected factor VIII (8) or factor IX (9) gene are considered "carriers," because hemophilia is passed down on the X chromosome. If a mother does not know her carrier status when her child is diagnosed with hemophilia, she may consider carrier testing, both for family planning purposes and because it could impact her personal health, since carriers may exhibit the bleeding symptoms of hemophilia (e.g. during surgery and childbirth). How Do You Become a Hemophilia Carrier? Who Should Be Tested for Carrier Status? Hemophilia is caused by a problem in one of the genes that tells the body to make the clotting proteins (called coagulation factor). These genes are located on the X chromosome. A female who inherits one affected X chromosome is said to become a carrier of hemophilia. In other words, she carries the gene that causes hemophilia on a chromosome. She can pass the affected gene to her children. Sometimes a baby will be born with hemophilia, but doesn’t have a family history of the bleeding disorder. If the baby is the first one in the family with hemophilia, the mother might be a carrier. It is possible that the affected factor VIII (8) or factor IX (9) gene did not exist in the mother, meaning that the affected gene was not passed down to the child. In this case, the mother is not a carrier, and the baby's hemophilia is caused by a new change in a gene, called a spontaneous mutation. To make it simple: a woman who is a carrier has a 25% (one in four) chance of having a son with hemophilia with each pregnancy. In rare cases, a girl may also be born with hemophilia when the father has hemophilia and the mother is a carrier. 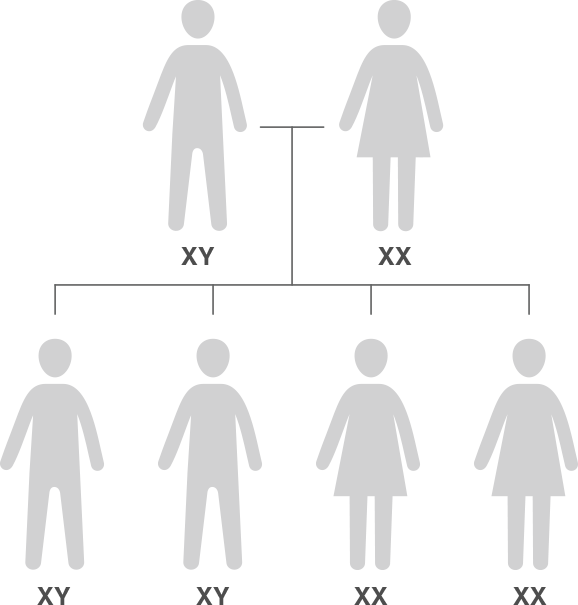 In this example, the mother is a carrier of the hemophilia gene and the father does not have hemophilia. 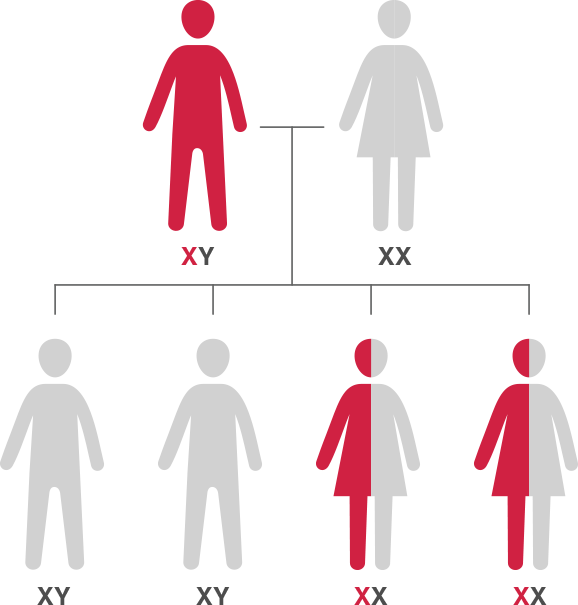 In this example, the father has hemophilia, and the mother does not carry the hemophilia gene. 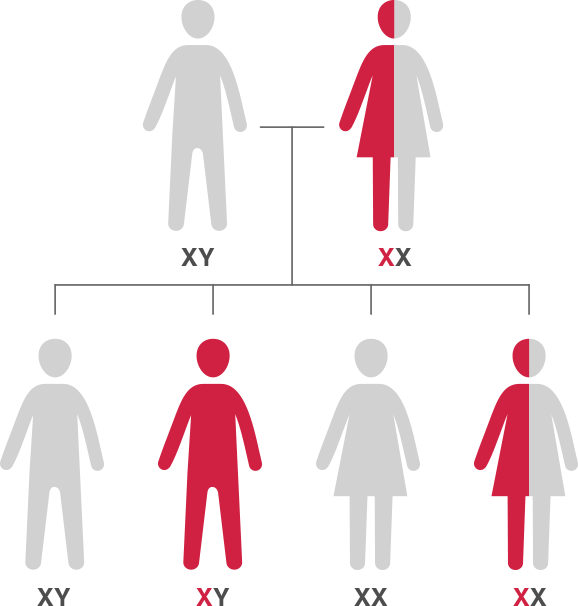 In this example, the father does not have hemophilia, and the mother does not carry the hemophilia gene. The National Hemophilia Foundation’s Medical and Scientific Advisory Council (MASAC) recommends that girls and women who are at risk of being a carrier for hemophilia be tested before they become pregnant. Testing clotting factor levels is a first step to help learn if a woman carries the hemophilia gene. If the clotting factor test results are uncertain, MASAC recommends genetic testing to determine if a woman is a carrier. Hemophilia carrier testing can provide valuable information for women and their families. Testing for factor levels and carrier status can help women manage their own health, make wise reproductive decisions, and alert female relatives who also may be affected and want to be tested. For more information, go to MASAC Guidelines #197. A woman who is or might be a hemophilia carrier should ask her female relatives about any bleeding problems they might have. There is no right age to test a woman’s hemophilia carrier status. Some families delay testing; others test a child who may be a carrier early so any necessary precautions can be taken. Typically, females are tested for carrier status when they are old enough to make an informed decision, usually some time after menarche. Even if the carrier status is unknown, medical professionals recommend that possible carriers get their clotting factor levels tested early in life and before a planned surgical procedure. Some women may want to wait until pregnancy to determine their carrier status. However, testing before pregnancy is more prudent. One reason is that clotting factor levels rise during pregnancy, making tests results unreliable. Moreover, the results of genetic testing may not be available for weeks. Pregnant carriers should notify their obstetrician/gynecologist and plan for the delivery and possible care of a baby with hemophilia. Hospital staff must be prepared to provide appropriate treatment for the mother and child. Labor and delivery pose potential threats to babies with hemophilia because of the trauma related to the birthing process. A baby with hemophilia should not be delivered with forceps or suction extraction (called vacuum delivery); some doctors and women may opt for cesarean delivery, which can help reduce the risk of injury to the baby. Learning that you or someone you care for is a hemophilia carrier can be an emotional and challenging time. How you feel about knowing that you or the person in your care is a carrier often depends on experience with members of the family who have been dealing with hemophilia. A father and brother’s attitude to having or not having hemophilia can also affect your reaction. Use available support from HTC genetic counselors and local or online support groups. How a person deals with the possibility of passing hemophilia on to a child depends on many, often complicated, factors. Genetic counselors can help as decisions are made about parenthood, whether to continue with a pregnancy, childbirth, and raising a child with a chronic health condition. Issues affecting the decision-making process may include the severity of the hemophilia that occurs in the woman’s family and her own desires, culture, and religious beliefs, as well as those of her partner. Couples can and should turn to trusted family members, friends, and professional advisors to talk about the personal and emotional aspects of testing and test results. The physician, nurse, and social worker at an HTC can provide information on the health issues, financial matters, and practical aspects of raising a child with hemophilia. Genetic counselors can also help families better understand their emotions, as well as address their concerns.